data X type I .
data Y type I .
class-data COUNT type I . In this class, static attribute count is responsible to maintain the number of created Point instances. data(a) = new zcl_point( iv_x = 1 iv_y = 1 ). data(b) = new zcl_point( iv_x = 1 iv_y = 2 ). data(c) = new zcl_point( iv_x = 1 iv_y = 3 ). data(d) = new zcl_point( iv_x = 1 iv_y = 4 ). Via any variable of a, b, c or d, we can monitor the value of count in debugger. Can we access the static attribute of a class without object instance in debugger? 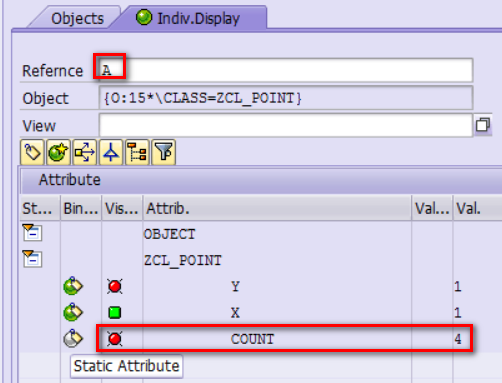 Since in theory the static attribute belongs to class instead of any dedicated object instance, so question comes: is there approach to monitor the static attribute value in ABAP debugger directly from class instead? Yes it is possible. 2. double click, and you can see the attribute value is directly maintained in class ZCL_POINT, without any object instance created on top of it. data(lo) = CAST cl_abap_objectdescr( cl_abap_classdescr=>describe_by_name( 'ZCL_POINT' ) ). read TABLE lo->attributes ASSIGNING FIELD-SYMBOL(<count>) WITH KEY name = 'COUNT'. 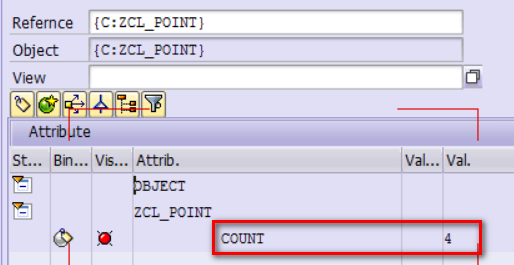 Since the structure is read-only and not editable outside cl_abap_objectdescr. This makes sense otherwise the encapsulation will be violated. Just check many other attribute marked as read-only in Class/Object descriptor class. Check the following code which demonstrates how to access private static attribute value in code via Reflection. For ABAPer it is easy to understand the usage of Class object in Java by just comparing it with CL_ABAP_CLASSDESCR in ABAP. Unlike RTTI in ABAP, Java reflection can sometimes lead to security issues, see one example how Java Singleton would be bypassed in blog Singleton bypass – ABAP and Java. 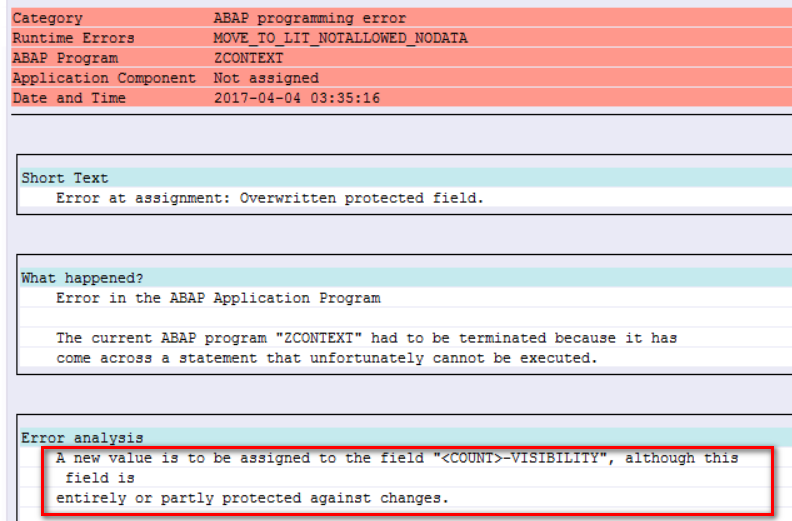 the ABAP part where you attempt to change the visibility of the private field is a bit confusing: You seem to expect that changing the visibility of an attribute in the class descriptor would have the effect of making the attribute public, but the class descriptors returned by the RTTI services have no such relation to the actual classes. What you’re running into is simply that CL_ABAP_OBJECTDESCR declares its attibute ATTRIBUTES as READ-ONLY. Almost all the public attributes of the RTTI classes are read-only, simply because changing them does not make sense: They are descriptions of certain types as they exist in the system, and changing these descriptions would only mean that you have messed up the description, not that you have actually changed anything about the object.